A wonderful week here in the garden…..As I mentioned this is the time of year I look forward to all summer long. I love to be out in the chilly mornings with the cold hardy plants. And then there is always that amazement of the plants that thrive at this time of year. The cold hardy broccoli grows so quickly and looks so strong and robust. Our Nappon Cabbage is lovely too right now. The radishes seem to develop over night and the spinach looks juicy and thick. Lots of crop harvesting and fun to finally see the yield of many vegetables we planted so long ago. We have had 2 light frost here and 1 hard frost last night so many of the tender plants are done. I know everyone is sad to see the amazing eggplant disappear from the boxes. I have honestly never seen eggplant thrive and produce the way it did this summer….The tomato vines froze hard and we had a flurry of harvest to get the last beauties in before the cold. I think we will have enough tomatoes stored for one more week and then they too will be gone until next season. We were very pleased with this crop and have made some notes as to favorites as well as “never again” for next year’s planting. I always like to test a few new guys every year and see what we think. The pepper plants got quite a chill and we harvested everything that was out there before the frost. This will be the last week of this astounding crop. Fun stuff is all set for the last few boxes and we are excited to share the Autumn Season with all of you. Kale-It sure is a pretty. Almost like a bouquet. Delicious flavor as the temperatures cool. We love to eat it on our sandwiches. And I know I said it before Kale Chips/Crisps are better than potato chips! Give it a shot this week-kids love them. Acorn Squash-We lost many acorn plants when the zucchini plants went down in Spring. So sadly this is it for acorn. 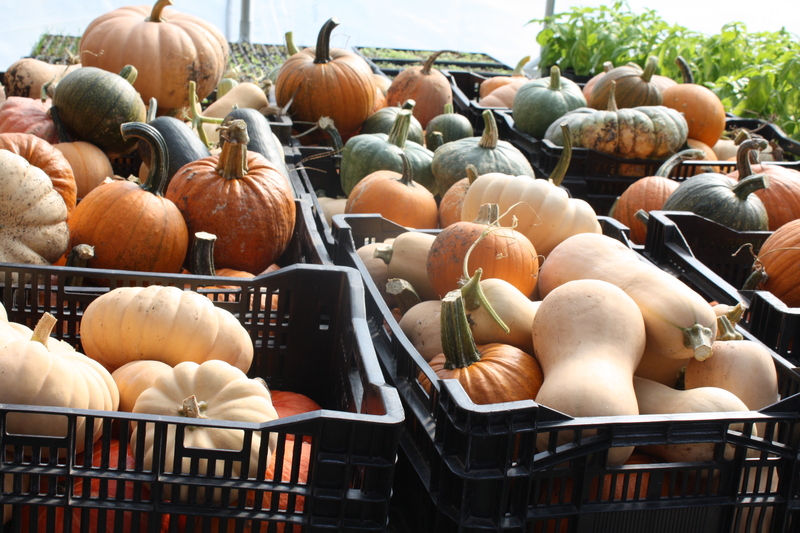 Never Fear….Tons of other winter squash in the last few weeks of the season. The butternut harvest is HUGE! Cabbage-This is the sweet little single serving size that we love to grow. Baseball/Softball size. Green Tomatoes-The once a year offering that marks the end of the season. Do try fried green tomatoes or explore a few recipes on the internet for tasty breads or cakes. Cherry Tomatoes-Savor these gems, we are near the end. Paste/Slice Tomatoes-Also near the end of the season. What a great run. Green Beans-We are thrilled to have beans this late in the season. We kept the row covered through the frosty nights so hopefully more to come. Peppers-The usual medley. This will be the last week for these wonders. Parsley-Flat large leaf is our favorite. Great in soups. Also, fun to make a pesto for pasta. 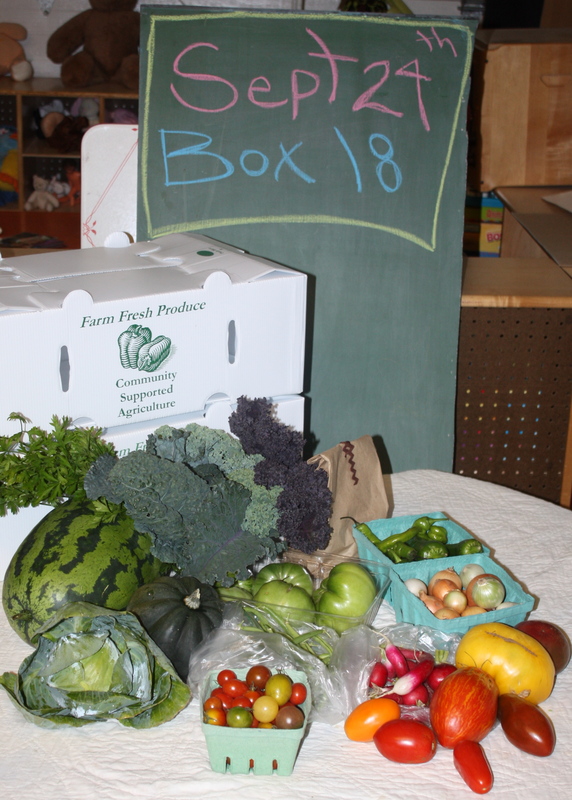 Onions-An assorted box this week. Watermelon-We went through the patch again before the frost and HOLY COW! harvested almost 50 melon! Crazy!!! It is funny to me to have winter squash and watermelon in the same box. Ornamental Gourds-A fun treat for the season. Enjoy! Basil Snips-A basket on the table to grab what you want. These are grown in the greenhouse-perfect and flavorful. 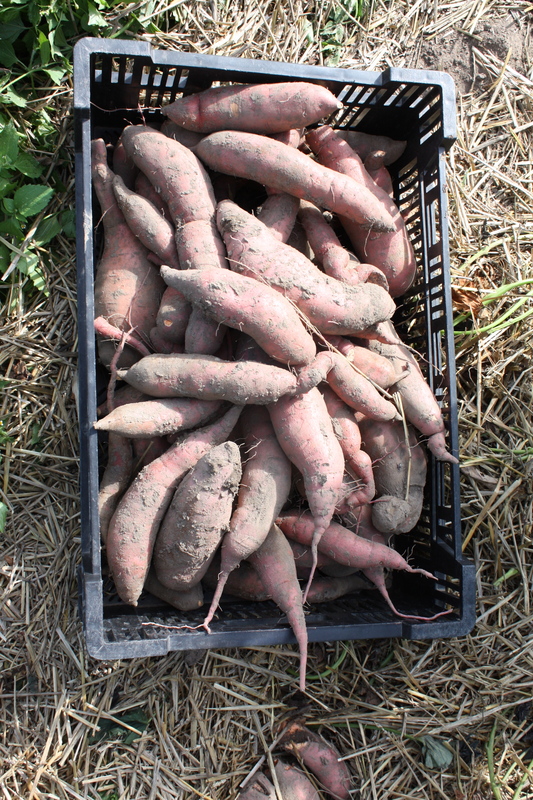 Thought you might like to see the sweet potato harvest. Scott starting the sweet potato harvest. The plastic mulch has just been removed and the irrigation tape pulled up. 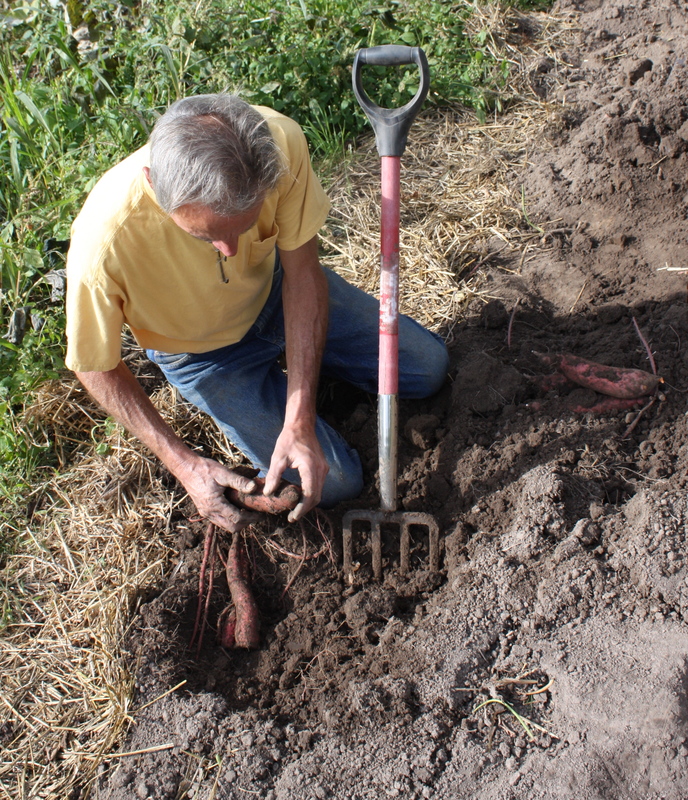 Hand digging the sweet potatoes. Scott working his way down the row. 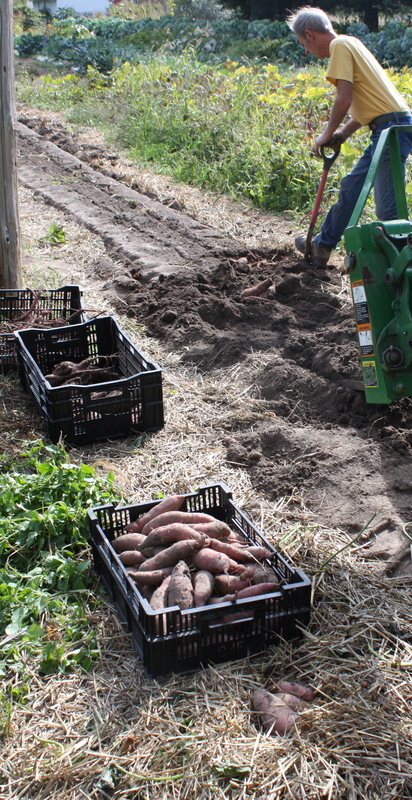 Laying out the sweet potatoes to cure in the greenhouse. 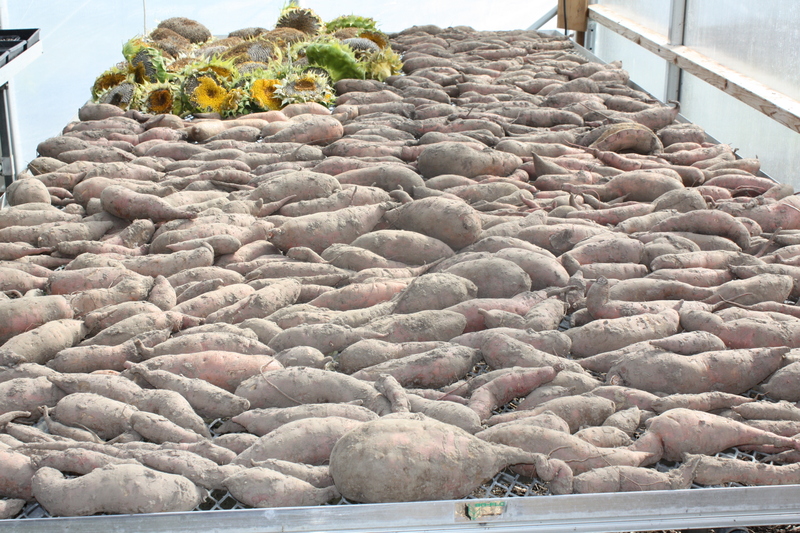 The amazing sweet potato harvest. Next week’s box. 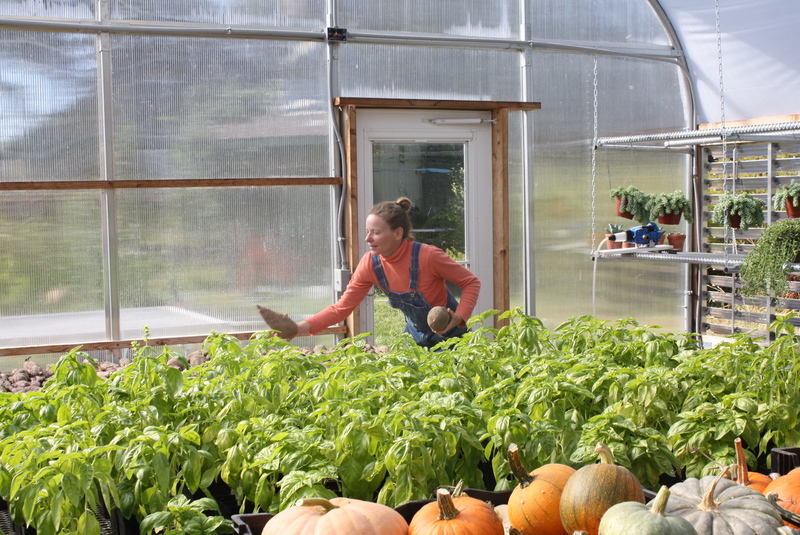 The winter squash and pie pumpkin harvest.